Herman Heyn, Hine, Hyne- Baltimore's Street-Corner Astronomer, astronomy, Fells Point, Harborplace, Charles Village, Baltimore, Maryland. Herman Heyn - Baltimore's Street-Corner Astronomer. WHAT'S HERMAN FOCUSED ON THIS SUMMER 2017? WHAT'S HERMAN FOCUSED ON THIS SUMER 2018? A whole bunch of main features....Jupiter and its moons, Saturn with ring Mars (by late July), and then our heavily cratered Moon glides by monthly. His old reliable 8" scope having become too heavy for him to safely lift, he has down sized to his classic 3" refractor. Because the latter is too light weight to accommodate the Fells Point trade, he has moved his "observatory" to the corner of St. Paul and 32nd Sts. in Charles Village. Since he is so weather dependent, anyone wishing to visit him on a particular evening should call him (410-889-0460) (NOT EMAIL) early evening. Mid August he'll be away for twelve days visiting family. to view an article commemorating Herman's 25 years of offering his telescope to the public for viewing the stars and planets. 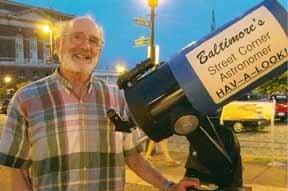 Look for the Baltimore Street-corner Astronomer in Fell's Point (mostly weekends) when the skies are clear. Everyone is welcome to look through the Hav-A-Look 8" schmidt-cassegrain reflector telescope. You will see the planets (when visible); Saturn and its rings, Jupiter and its moons, Venus, Mars, distant planets such as Uranus (if you're lucky) and close-ups of the moon's craters - a fantastic sight! You can even look at the Sun's eclipses and Sun spots (when visable) during the day through a special filter. For last minute go/no go info for Fells Point, call Herman late afternoon: 410-889-0460. "On a family trip out west in 1969, I'd bought a plastic cowboy hat. Back home I found I was allergic to it, so it just sat on a shelf (it was pretty). The afternoon of 11/13/87, I got tired of looking at it, stomped on it, and put it in the trash. On my way out the door to Fell's Point, I had this "ah ha" flash that I should take a contributions hat. I pulled my cowboy hat out of the trash, straightened it out, and took it with me. That night it collected $10.00, the next night $40.00. My appetite was whetted, and the rest is history!" "My enduring interest in astronomy began with Miss Wicker in 8th grade general science at Garrison Junior High. One day she drew the Big Dipper on the board and instructed us to find it that night. I did, and was immediately hooked. As a teenager I'd read a huge number of astronomy books and become pretty conversant with the subject. My supportive father bought me a 3" refractor but, soon after, I sold it. In 1978, having some spare cash from selling my house, I bought my first adult telescope, another 3" refractor. Rather than disciplined observing, my main activity with it was visiting schools (with a slide show, too) and entertaining friends at cookouts. 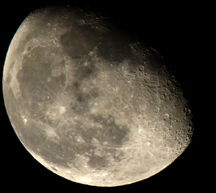 In 1981 I acquired my 8" Meade SCT from my son, who received it from his wife as a wedding present years earlier. My Baltimore's Street-Corner Astronomer career began Friday, the 13th of November, 1987. It was a gorgeous early evening sky with both the Moon and Jupiter front and center. I had nothing special going on, so I decided to take my 8" to Fell's Point to share the sky's beauty with the public." Because he dispenses so much information, many of his lookers ask Herman if he's a teacher. In 1978 he received an elementary education degree from Coppin State Teachers College (now Coppin University). After practice teaching and being certified, he decided full time class room teaching was not for him. He launched into a series of work-a-day-world jobs, ranging from lab tech to office manager for a small construction company (lasted 12 years). A Korean war vet, he also spent four years as office manager of the Baltimore Peace Action Center, an anti-Vietnam war organization. Between 1984 and 1995, operating as HC Designs, Inc., he designed and marketed t-shirts. His first designs were Halley's Comet followed by a very successful line of grand opera t-shirts and tote bags. Herman thanks his lucky stars for the day he discovered "street' telescoping because, he says, "It's far and away what I do best in this world." Website by Steve Cunningham, Baltimore, MD. Creative designs to fit your needs.